You can select a standard or customized shape effect filter and apply it to the spotlight or playlist. To change the shape of the effect, select Shape, press Enter ( ), select a shape option, and press Menu to exit. Note: The standard shape effect filters are Circle 1 to Circle 3 and Rectangle 1 to Rectangle 3. 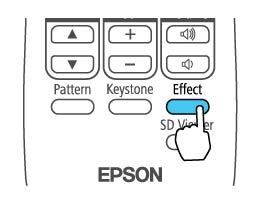 You can also create custom shapes using the Epson Projector Content Manager software. To apply a filter to the effect, select Filter Effect, press Enter( ), select a filter effect option, and press Menu to exit. To change the size of the effect, select Size, press Enter ( ), and use the left and right arrow buttons to adjust the height and width. Press Menu to exit. To change the position of the effect, select Position, press Enter ( ), and use the arrow buttons to adjust the position of the shape. Press Menu to exit.